Andrew Ogwetta makes his submission during the Annual General Meeting. He said the rights body will be blamed if members fail to act. Courtesy photo. The row between the Acholi cultural institution the ‘Ker Kwaro’ and Human Rights Focus a non-government organisation, over property and a building located along plot 5/5A air field road next to Bank of Uganda has taken a new twist after the rights body appealed the Gulu High Court ruling of June 28 that decided that the said properties belong to His Highness the Paramount Chief. The rights body dragged the cultural institution to court following reports that the said property had been given to His Highness the Paramount chief by President Museveni and that the former needed rent for the building amounting to Shs1.5 million monthly or else the tenants leave. Human Rights Focus lawyer Donge SD Opar said they have been paying Shs90,000 in rent fees for the last 20 years until 2016 when the Acholi cultural institution wrote to them demanding that they begin paying Shs1.5m to the paramount chief. Counsel Opar said the fee was very high compared to what they had been paying before and they were not certain that Ker Kwaro was the rightful owner of the property. He said they attemped to contact ker kwaro in vain, until a letter come from the Uganda Land Commission (ULC) indicating that the said house and land was given by the President to the paramount chief. However, the Chief Magistrate of the Gulu High Court, D. Ssejemba, ruled that the NGO vacates the property and that there is no difference between the paramount chief and the cultural institution. However, counsel Opar said it was illegal to give out property to a third party without considering the immediate tenants who even expressed interest in buying the said building. Opar said when the rights body went to verify the ownership of the land title, it was discovered that instead of the Acholi cultural institution Ker Kwaro, the title was in the name of the Paramount chief. He said this is not proper because the cultural institution is a legal entity which can own property and that the Paramount chief owning property purportedly for the cultural institution is an act of fraud and contravenes the Constitution. Opar said the position of the paramount chief isn’t permanent and he is also answerable to the other 52 chiefs. Human Rights Focus executive director Odongyoo in his office. As the rights body held its annual general meeting at the Gulu District council hall, 28 members against four voted to proceed with the appeal in support of the organization principle of condemning impunity and seeking justice. One of the members, Mr Andrew Ogwetta Otto, while making his submission, said the organisation will in future be held accountable if the members do not act. “We have been fighting for justice but now we are faced with a situation where one of our partners wants to override justice,” Ogwetta said. 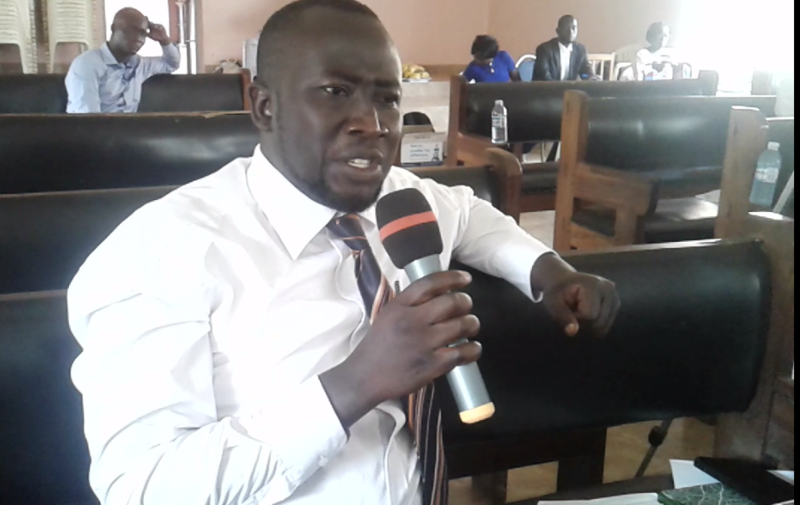 Ambrose Oola, the prime minister of the Acholi cultural institution, however, noted that there is no problem with the land title bearing the name of the Paramount chief. “Court has pronounced itself on the matter and ruled that the building in question belongs to Ker Kwaro. It is, therefore, upon the rights body to choose what steps they want to take,” Olaa said. The Human Rights Focus executive director, Francis Odongyoo, when contacted for a comment said the house belonged to African Trade and Development Bank managed by the Privatisation Unit under central government. He said it was a store for food stuff during the reign of Idi Amin Dada. Odongyoo said the property was first claimed by the National Chamber of Commerce but the President declined to give it to them, stating that it is government property and that it was Parliament supposed to give it out. ‘‘We wanted to buy the building but in 2016, we got a letter from Okello Samuel, the Personal Assistant of the Paramount Chief, indicating that the cultural leader wanted to redevelop the land and wanted sitting tenants to vacate the building. Information obtained from Privatisation Unit in related correspondences shows that they didn’t get any communication from either the Office of the President or that of the Paramount Chief to show that the ownership the property had been transferred. In a related communication, The ULC wrote to the privatisation unit indicating that the said land and property belonged to the defunct government agency; Foods and Beverages and that it was under the care of the Office of the President which allocated it accordingly. Mr Odongyoo also said they were not given enough time to vacate the property yet they had occupied the building for decades. “We were not treated fairly by the Paramount Chief. If he really needed the building, he should have expressed interest so that we can compete as the sitting tenants and current managers of the building,” Odongyoo said.